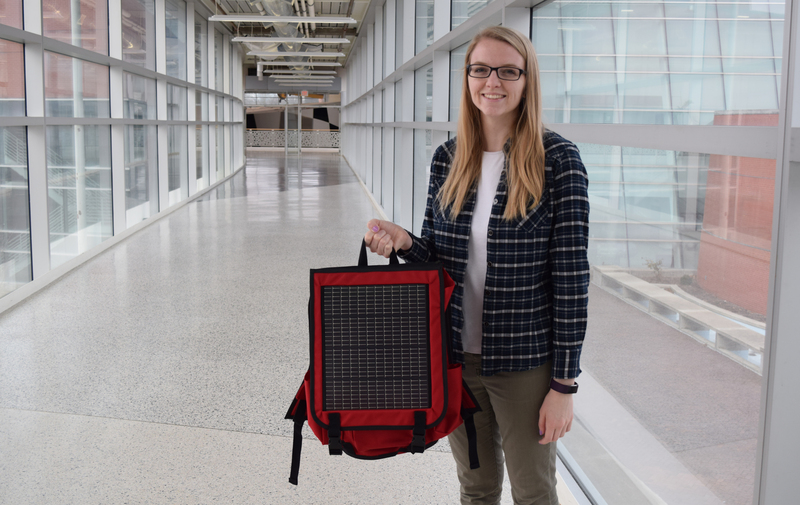 Courtney Beringer, a senior in mechanical engineering, poses with the solar panel-equipped backpack that she has spent the past three years prototyping and designing. A dying cell phone or laptop battery can be a source of anxiety for an already busy college student, but a project by a mechanical engineering senior aims to alleviate that. Courtney Beringer, a senior in ME with a minor in energy systems, has spent the past three years working with Eulanda Sanders, Donna R. Danielson Professor in Textiles and Clothing and Chair of the Department of Apparel, Events, and Hospitality Management (AESHM), developing and prototyping a solar panel-equipped backpack. The idea for the backpack came about because of Beringer’s participation in the first-year mentor program offered by Iowa State’s Honors Program. Sanders was interested in overseeing an interdisciplinary project that would bring engineering students together to design a wearable product incorporating solar panels. Beringer jumped at the opportunity since it allowed her to combine her two passions: engineering and environmental sustainability. She started on the project in January of 2016 and worked with Sam Vande Loo, a fellow undergraduate in ME. She then conducted industry-approved tests on the textile materials to determine what was best for a book bag with electrical integration including color fastness, abrasion and water resistance. By incorporating design and drafting skills she learned in the ME curriculum, she was able to determine the correct electrical components and proper solar panel size. She also incorporated design features suggested by her survey respondents such as laptop and water bottle pockets, a removable panel, battery storage and the ability to charge a laptop. Much of the research took place in the textile experiment labs and product development facilities inside LeBaron Hall. Beringer also collaboarted with Ames-based PowerFilm Solar on this project. “Like assembling any part in engineering, when sewing the order and method of assembly is extremely important in creating a shelf ready product. With the help of graduate students, I learned to sew and completed two prototypes and a final product,” Beringer said, adding that she was grateful for the help from now-AESHM Ph.D. graduate Chanmi Hwang and current AESHM doctoral student Bingyue Wei. After developing a near-final prototype she submitted an abstract and a 30-page paper about her project to the International Textile and Apparel Association Best Student Paper competition in April. She was notified the following month that her project had received first place. “I was so surprised and thankful. This research has taken a lot of time and effort and it was wonderful to hear that scholars appreciated the work,” she said, adding that she completed the final product in October of 2018 then had the opportunity to present her research at the International Textile and Apparel Association (ITAA) Annual Conference in Cleveland, Ohio earlier this month. Beringer grew up in Dubuque, Iowa and excelled in math and science classes. She developed an interest in the environment through her involvement in the Sierra Club as well as her middle school’s composting program. “As I went through school with these two interests, I started to learn how I could combine my passion for the environment and my skills in math and science through engineering,” she said. Attending Iowa State was an easy choice for her, given the university’s strong reputation for engineering coupled with all of the opportunities that a large academic institution offers. Beringer has presented at the National Conference on Undergraduate Research in Oklahoma, Research at the Capitol in Des Moines, and the Iowa State Conference on Undergraduate Research in Ames. Additionally she has worked in the Experimental Multiphase Flow Lab, overseen by Ted Heindel, Bergles Professor of Thermal Science and a professor of mechanical engineering. Beringer plans to complete her degree in May 2019 and after graduation will work in Des Moines, designing and consulting green energy systems for new buildings. After that she plans to attend graduate school where she will pursue a doctorate in the renewable energy field. Where can I buy one for my Granddaughter?